We’d love your help. Let us know what’s wrong with this preview of The Shining Wall by Melissa Ferguson. This is the frightening yet moving story of orphaned Alida and her younger siste In a ruined world, where wealthy humans push health and longevity to extremes and surround themselves with a shining metal wall, privilege and security is predicated on the services of cloned Neandertals, and the exploitation of women in the shanty towns and wastelands beyond the fortress city. To ask other readers questions about The Shining Wall, please sign up. This is a story about power – the powerful and the powerless, the haves and the have nots. 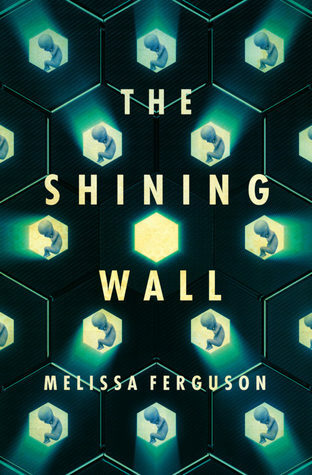 In a future The blurb of The Shining Wall (Transit Lounge Publishing 2019) tells us that author Melissa Ferguson is ‘a cancer-fighting scientist who loves to explore scientific possibilities through fiction’, and in her debut novel about the dystopian society of a ruined world, she certainly combines her scientific knowledge with her creative imagination to create a world both frightening and apocalyptic. The Shining Wall was a real cross over book for me. I found that it had incorporated the best elements from other books and spined it into a strong and unyielding tale. You have a dystopian society of a ruined world, which is written better than many other dystopian worlds I have read. You get the wealthy people of the world living privlidge lives beyond the shining wall, which is very much has a Hunger Games kinda feel to it. You have robot technology which provides security and order, and that The Shining Wall was a real cross over book for me. I found that it had incorporated the best elements from other books and spined it into a strong and unyielding tale. You have a dystopian society of a ruined world, which is written better than many other dystopian worlds I have read. You get the wealthy people of the world living privlidge lives beyond the shining wall, which is very much has a Hunger Games kinda feel to it. You have robot technology which provides security and order, and that felt like a complete iRobot moment. All of these amazing concepts were rolled up into a nice little taco and damnnn that taco was delightful. The Shining Wall mostly focuses on the play of power within the society of this apocalyptic world. Those that are wealthy enough to live beyond the wall have used technology to their advantage, extending human life and treating any forms of illness. Outside the city walls in the Demi-Settlements are people ravished by hunger and disease, forced to live in the slums and steal what they can to survive. The complete opposite of the city pretty much. Alida and her younger sister Graycie are orphaned and left to fend for themselves in a soicity that has no place for the likes of them. Alida is desperate to keep her and her younger sister alive and will do that at almost any attempt possible. I love the kickass, strong young female that Alida is and no matter the desperate situation, she always attempts to keep her younger sister happy and I loved that. It was a true girl power move and I couldn’t be more pleased with this sister dynamic. There was times where this book dragged and fell behind on its pace, but it wasn’t for long periods of time. Overall this book was brilliant to read and I loved the futurist elements to it. Melissa is a cancer-fighting scientist and defender of the reputation of Neandertals. While her family sleeps she thinks about cyborgs, cults, zombies, enchanted woods, future science, extinct species of humans, and infectious diseases, and tries to mash them together into awesome stories. Her short stories have appeared in Postscripts to Darkness, Pavor Nocturnis Dark Fiction Anthology, [untitled Melissa is a cancer-fighting scientist and defender of the reputation of Neandertals. While her family sleeps she thinks about cyborgs, cults, zombies, enchanted woods, future science, extinct species of humans, and infectious diseases, and tries to mash them together into awesome stories. Her short stories have appeared in Postscripts to Darkness, Pavor Nocturnis Dark Fiction Anthology, [untitled], and Island. Her adult dystopian novel The Shining Wall is due to be released in April 2019 by Transit Lounge Publishing.